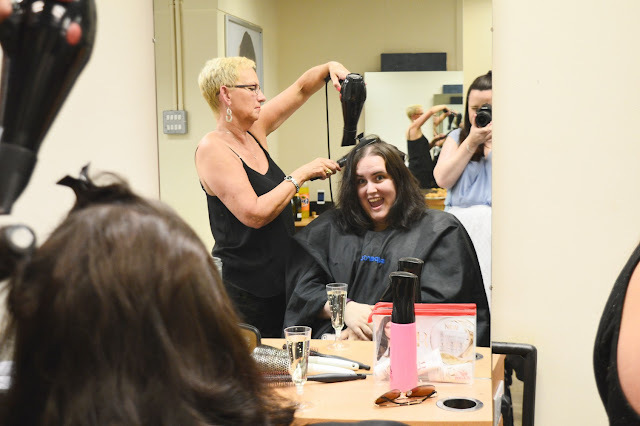 A few weeks ago (I'm way behind on posts lately, let's be honest), Supercuts contacted me and several other local bloggers to get our pamper on. Sarah, Liv, Sam, Kayleigh, Tasmin, Hannah and I all met in Dunkin Donuts beforehand. After St. Johns Shopping Centre closed, we dipped under the shutters and were met by Jenny, the salon manager who greeted us with a smile, nibbles and (arguably most importantly) bottomless prosecco! I plopped myself down in the chair and the lovely Julie asked me a few questions about my hair, and on impulse, I told her to cut it all off! Everyone else was getting their hair curled and styled, and here's me deciding to just lop all my hair off. We were there for a good few hours. Everyone was either getting their hair or nails done or sipping away on prosecco, chatting and catching up. I was made up to get an OPI Gel Colour manicure! I opted for Big Apple Red because there's nothing better than a good red nail. After a couple of glasses of prosecco, I decided I was brave enough (read: foolish) to have my eyebrows threaded for the first time ever, Although my brows are still in great shape a few weeks after, threading is definitely not for me! 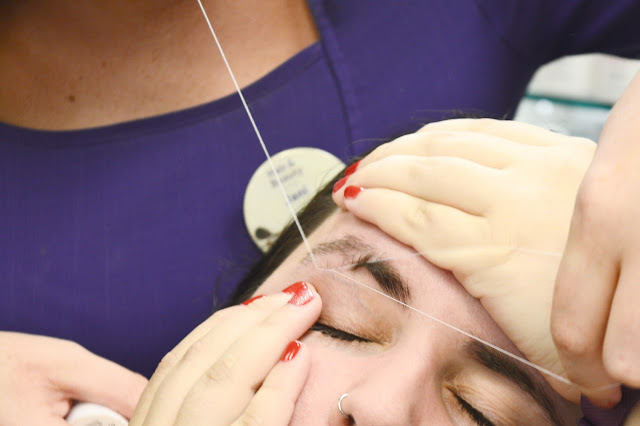 I may or may not have shed a little tear during the threading. Who knows? After having a chat with all the staff, who were all genuinely passionate about what they do, they gave us a lovely little goodie bag to top the evening off, filled with TIGI, OPI and Max Factor goodies! Everyone looked absolutely stunning by the time Jenny and her team of beauticians had finished! I had the BEST time with my blogging squad, and I'm pretty sure we are legit #SquadGoals. This was such an amazing evening! Had so so much fun! I also love how I look like a little pea head in the header image haha!